These crazy-good fried chicken tacos aren't for weeknights--but they aren't hard at all. Save them for a weekend party, when you'll have time to make TV host and author Andrew Zimmern's Tomatillo-Avocado and Grilled Pineapple salsas, too (also available on midwestliving.com). For pickled onions: In a resealable plastic bag, combine vinegar, sugar, red onion and jalapeno pepper. Seal bag; turn to coat. Let sit 10 minutes or so to allow sugar to dissolve, then place in refrigerator to marinate for 24 to 48 hours. Drain and discard marinade before serving. For chicken: In a small skillet, toast oregano, cumin, fennel, ancho chile, caraway, coriander and cinnamon over medium-high heat until fragrant, 1 to 2 minutes. Let cool. Grind spices in a spice grinder or with a mortar and pestle (or, if lacking those tools, place mixture in a resealable plastic bag, then crush with a rolling pin). Set aside. Clip a thermometer to an 8-quart pot. Heat lard to 350 degrees . Add shallots, celery, garlic and thyme. Working in batches, add chicken pieces. Fry 20 to 25 minutes, or until chicken reaches 175 degrees on an instant-read thermometer. Using tongs, transfer chicken pieces to paper towels to drain. When cool enough to handle, remove meat and skin from bones. Shred meat and chop the skin. Transfer chicken meat and skin to a large bowl. Add spice mixture, white onion and half the cilantro. Season to taste with salt. Serve chicken in warm tortillas with lime wedges, remaining cilantro and pickled red onion mixture. 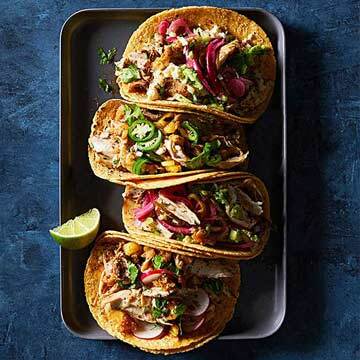 *Prep tip You can substitute a neutral oil, like vegetable, canola or corn oil, but the lard gives the chicken an unmistakably authentic Mexican flavor.